A mesmerizing live performance by Sky Magic in front of Mt. 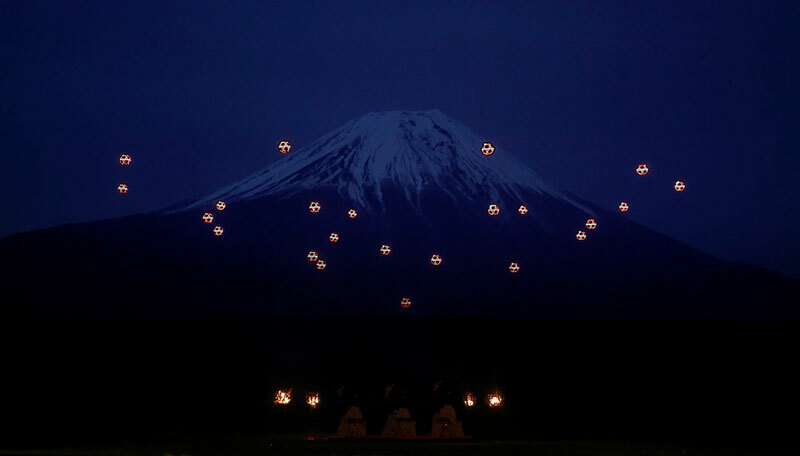 Fuji using 20 MIDI-controlled drones with 16,500 LED lights that dance in unison accompanied by a trio of Shamisen players from Tsugaru-Shamisen Oyama-kai, founded in 1963. Sky Magic is a project by Japanese ad agency MicroAd that utilizes unmanned flying machines synchronized with audio effects to provide an audio visual extravaganza, a potential new method for advertising and entertainment. A mesmerizing live performance by Sky Magic in front of Mt. Fuji using 20 MIDI-controlled drones with 16,500 LED lights that dance in unison accompanied by a trio of Shamisen players.